Neymar of Brazil celebrates scoring the winning penalty in the penalty shoot out of the Rio Olympic men's soccer final over Germany at the Maracana Stadium on Saturday, August 20, 2016. Brazil won its first gold medal in men's soccer on home turf Saturday, edging Germany in a tense penalty shootout after the game ended tied 1-1. Brazil's captain and star player Neymar scored the winning penalty, booting the ball into right corner as the German goalkeeper dove the wrong way. He broke into tears as his teammates swarmed him in a rapturous Maracana Stadium in Rio. Neymar, who plays for FC Barcelona, opened the scoring in the first half with a precise, arcing free kick that bounced in off the crossbar, past the goalkeeper's outstretched hand. Germany turned on the pressure and struck back in the second half thanks to a quick-fire kick from Maximilian Meyer — the first goal Brazil conceded at the Rio Games. Brazil seized the initiative after that, but Germany resisted attack after attack from the home team to take the game to penalties. For four rounds, each shooter scored. But Brazilian goalkeepr Weverton saved the fifth German kick, setting up Neymar for the dramatic win. He stuttered as he approached the ball, trying to read which way the goalie would dive, then made history in a match that carried deep significance for Brazil, where soccer (called futebol there) is the national sport. Brazil was looking to avenge a 7-1 loss to the Germans two years ago in the World Cup, and the atmosphere at the nearly 80,000-seat Maracana Stadium was electric for Neymar's goal. It was thunderous at the finale. 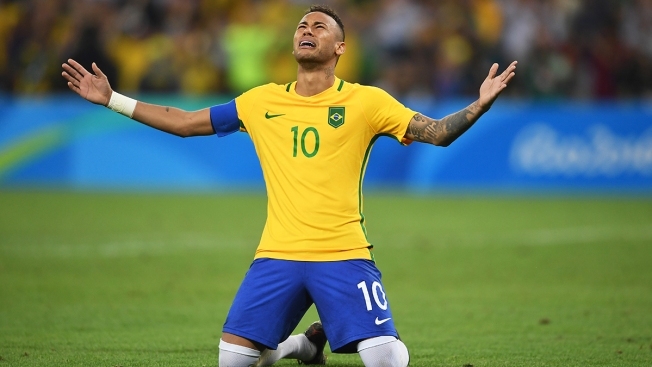 "I don't have words to say anything," Neymar said later, sobbing. "I can't describe my feelings right now. I just want to thank my teammates, my friends and my family, who have been by my side during the most difficult moments. It wasn't easy. I don't know what else to say, I'm just really happy." The final featured nearly entirely different rosters from the 2014 World Cup that marked a low point for Brazilian soccer. That's because Olympic soccer features under-23 teams while the World Cup is for the top national squad. Neymar didn't play in that match either — he was injured earlier in the tournament — and was the difference in the Olympic final. The gold medal he won for Brazil fills the empty space in the country's trophy case. Brazil has won five world cups, most recently in 2002, when they defeated Germany in the final thanks to two goals from striker Ronaldo, a legend in his own right. Brazil had won the silver medal three times and the bronze twice. Four years ago, it lost to Mexico in the final in London. Germany was playing in the Olympics for the first time since 1988, when it won bronze competing as West Germany. It had never won the gold, either. The bronze medal went to Nigeria earlier Saturday, as Sadiq Umar scored a pair of goals in a 3-2 victory over Honduras in Belo Horizonte. It was Nigeria's third overall Olympic medal in soccer. The West African nation won gold at the 1996 Olympics with a 3-2 victory over Argentina, and won the silver in 2008, falling to Argentina 1-0 in the final. Honduras, which challenged with a pair of late goals, heads home from Brazil empty-handed but the team's appearance in the medal round was its best-ever finish at the Olympics.